As an angler, you will need to have all the right equipment to get the job done and to enjoy your trip. Wading boots are one of the most important pieces of the puzzle and anglers need to invest a ton of time and effort to get the right boots. The best wading boots are not only durable, they are made from special fabric to ensure resiliency from not only water but the weather as well. We have dug a little deeper to find the right wading boots and ensure that you get the best possible value for your money. We have done all the legwork to ensure that you know exactly which features are the most important and how you should go about choosing your next pair of wading boots. Furthermore, we have also included a list of the top wading boots that we would recommend for the expert angler. That being said, if you are serious about angling or even fly fishing, this is a must-read to help you get the best possible value for your money. 2 What Are Wading Boots? 4 Rubber Soles Vs. Felt Soles: What Is The Difference? One of the most common questions asked by beginners is what wading boots are and why they should invest in this over a pair of normal working boots. Some think that any boot will do, but wading boots are made from waterproof and durable materials. The focus is not only placed on the durability of the boot, but it is placed on the comfort and the traction as well. Since rocks are slippery and you might not know exactly what you are dealing with underneath the water, you will have to rely on the boots to not only keep you safe but keep you from slipping and getting seriously hurt as well. Trying to catch a fish can quickly lead to a swimming session if you are not careful or have the right boots and having soggy boots will not be the best for your feet and will reduce the overall comfort as well. The boots are one of the most important parts you need to focus on if you are serious about angling and taking the financial knock will certainly pay off in the end, as the boots will last you a long time and improve the overall experience. A fundamental part of any boot is the comfort or the level of comfort is provides you. 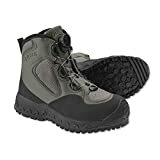 Wading boots are no different and you will need to focus on things like the midsole and inner sole when looking for a pair. If you suffer from pronation or even supination, it will be best to look for a memory foam inner sole, however, these soles can be quite expensive to buy and many people do not choose them for this reason. The next best option is EVA or EVA injected foam. These sole will use the air passing through to create comfort and they also absorb a ton of the shock. Much like the memory foam, the EVA soles will mold to the shape of your feet, leaving you with the utmost of comfort when spending hours on your feet on unforgiving terrains in the water. EVA is not as comfortable as memory foam, but it is a little cheaper too and will offer decent comfort. The final inner sole is the PU cushioning and this is polyurethane cushioning found in a most of the work boots on the market today. While these boots are still great and the cushioning is decent, it does not mold to the shape of your feet as much. PU cushioning has also been known to cause a break in period for the boots and this could reduce some of the comforts. Since you will be in the water and the surfaces tend to be slippery, you should consider having some sort of support system to keep you safe and keep you from getting serious damage if you should slip accidentally. The support system is generally in the form of a shank that will help offer some stability and ensure that you do not break ankles. There are a few support systems and while most of them work in the same way, having the right one will all depend on the boot you choose. We love the carbon shanks and while these are a little more expensive than the nylon and steel shanks, they offer the same strength and support as the steel shank with the weight of the nylon shank. The steel shanks offer a ton of support, but they also add a lot of weight to the boot that could have been avoided with. Nylon is much cheaper and is commonly found in normal working shoes. It is lightweight and only offers enough support and stability for normal environments. Nylon might still work for an angler, but it is definitely not eh number one option to consider. Traction is probably one of the most important features to look at and consider. The boots should have near perfect traction or you will find yourself swimming instead of angling. While you will need to make a decision between felt and rubber soles, we would generally recommend the rubber soles. It is also a little cheaper and offers decent durability. When looking at the outer sole, it is important to look at the quality of the rubber and to ensure that the lugs are wide and the rubber is hardened. While softer rubber can be quite tempting to invest in, it does not offer the same traction and the size of the lugs also play a massive part in helping you get the best possible value for your money and traction. If you continue reading, you will find our analysis of the felt sole vs. the rubber sole and you will be able to make an informed decision on which one you would like to buy and feel the most comfortable with wearing. While leather is the king of durability, it does add some additional weight to the boot, we recommend leather for the durability and having leather in your wading boots should not be considered a bad thing at all. However, synthetic leather is a little lighter and easier to work with, it might not have the same durability, but this can be spiced up with the addition of microfibers. Leather remains a great option, but the leather can also be damage from taking such a beating from all of the water. The leather should definitely be treated or tanned to ensure that is can hold up and you should let it dry naturally as well. Synthetic leather dries out much faster and the chances of cracks or damages appearing are greatly reduced as well. The lacing should also be taken into consideration and while speed lacing might not seem durable, it will hold up well in the water. Speed laces also have spare laces readily available virtually anywhere and the boot can be adjusted in the water whilst you are busy with your angling adventure. The durability does go hand in hand with the brand and the materials used in the boot. You will also find that the better the boot is, the more expensive it will be as there are a ton of knockoffs in the market that will only cost you money. It is also great to read reviews of the boots and to see how the glue has been holding up for people using it the water. As we have already mentioned, leather is the most durable material, but it is also heavy and over time it will start showing weakness against the barrage of water it has to deal with. We also recommend looking at the inner lining and while the Thinsulate lining is perfect for keeping you warm, the Gore-Tex linings will be much better for ventilation. It is inevitable that the water will eventually get inside and you will need to contend with this happening. This is where a great drainage system is handy and you do not need to take off the boots to get them dry. The ventilation also goes hand in hand with the drainage and the better the ventilation, the better the drainage will also be. As we have already mentioned, the inner lining plays a major part in keeping you dry and allowing ventilation and having great ventilation will only be a major asset to help the water get out just as fast as it got in If you are using it with fishing waders, you should also ensure that they fit the waders and there cannot be any gaping holes for the water to get inside. Rubber Soles Vs. Felt Soles: What Is The Difference? Anyone serious about wading has come across this question, should I consider felt wading boots or rubber wading boots? The differences are huge and many people stick to their old ways of felt. Rubber soles are a little cheaper to start with and with the improvement of technology, they now offer the same quality traction as you will find in the felt sole boots. Rubber is durable and it works perfect on both water and land, it offers great traction for the angler that loves to walk on the riverbank. The rubber soles also tend to be a little lighter and they do not wear as quickly as felt will. Experienced anglers will know everything about the felt sole and how it was once the number one choice. There are a few things about the felt sole that we do not like and the first one will be the durability. While they are well designed, the felt soles tend to lack durability and they wear down much faster than the rubber sole. The felt soles also lack a little traction when it comes to walking out of the water and on the riverbank. In terms of traction in the water, the felt sole offers a little better traction than the rubber sole on slimy rocks, but the differences are quite minor and you will need to replace the boots once the soles are fully worn out. The biggest downside to the felt soles is the fact that they are banned in almost any state in the US and many people do not like the effects of felt on the ecosystem. Aquatic Nuisance Species or ANS are a species that are not native to the water and they tend to end up on the soles and get in the water. These species can cause ecosystem problems and damage the fish that you are actually trying to catch. Felt soles are still available today, but they will offer you limited usage in certain states in the US. By now, you should have a better understanding of which features are the most important and why you should choose those specific features. You might also wonder which wading boots are the best and we have also done the legwork here. The Simms G3 Guide Boot is a well-designed wading boot that tries to raise the bar of wading. It is constructed of durable premium leather. It includes a multi-directional rubber outer sole that offers great traction on any slippery surface to keep you from swimming whilst you are angling. The RiverTread technology is patented by the Simms Company and you will have a one-of-kind outer sole with maximum support and traction. A TPU shank is used for support and comfort with an additional heel clip for extra stability when moving on these slippery surfaces. Neoprene has been used in the inner lining and this adds to the cushioning you will have. Neoprene also keeps you warm on the inside to give you a warmer wading experience. The boot is a little expensive and it is also compatible with all Simms’ AlumniBite and HardBite studs and cleats. We would highly recommend this Simms boot as one of the top wading boots for the serious and more professional angler. The Simms G4 Boa Boot is quite similar to the previous boot and it is made from a combination of synthetic and neoprene materials. The boot offers some decent ventilation, but one of the most important aspects is the draining ability it will give you. Water does tend to get inside over time, but the draining capability and the lighter materials will dry out in just a couple of hours. The outer sole also features the patented multi-directional lug pattern to give you superior traction on virtually any surface. While the Boa system gives you an asymmetrical feel and a secure fit with maximum support when in the waters. The boot also includes the neoprene finish and the inner lining is designed to keep you warm when fishing in the colder water up North. These boots are well priced for the features they offer and they will work in virtually any ice or cold environment. The boot is definitely designed for the more experienced angler and will allow you to trek on the shores of the riverbank with maximum traction as well. We would definitely recommend them for the comfort and the traction they offer on any surface. The Korkers HatchBack Wading boot is designed with multi-functionality in mind. The boot is also constructed from premium synthetic materials and the design is unique. With these boots, you will have the rear entry system, allowing you to easily slide in and out of the boots without actually having to take time. With these boots, you will have the rear entry system, allowing you to easily slide in and out of the boots without actually having to take time. The Flow Foam Fit System is perfect for that unique feel and it is known for the adjustability it offers, you could customize the fit to meet your need and the boots will feel much more comfortable when they are on. TPU is also used in the shank, which offers you some additional support and the 3-ply fit system adds additional security around the heel and Achilles. TPU is also used in the shank, which offers you some additional support and the 3-ply fit system adds additional security around the heel and Achilles. The interchangeable sole system is the main focal point and means that you could slide over any sole that you need. This offers you superior traction in all different conditions and the boot will be perfect of the shore as well. Finally, the drainage system is unique to Korkers boots and will also provide you with perfect ventilation.inally, the drainage system is unique to Korkers boots and will also provide you with perfect ventilation. These boots are relatively affordable for all of the features you are provided with. The traction is near perfect and we would highly recommend these boots for the versatility they offer to support you on virtually any slippery surface. 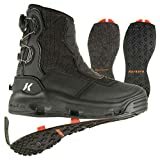 The Korkers BuckSkin Wading Boot with Felt and Kling-On Outsoles is a decent wading boot offering you the same versatility as the previous pair from Korkers. The boot is much cheaper and should be an ideal starting boot. The upper materials are made from synthetic and microfibers, which means that they are lightweight and will dry out much faster than leather. The boot is much cheaper and should be an ideal starting boot. The upper materials are made from synthetic and microfibers, which means that they are lightweight and will dry out much faster than leather. The interchangeable sole system on the boot is compatible will also Korkers 3.0 accessories and you will also receive these Kling-on and felt soles with your purchase. This boot is one of the cheaper versions on the market today and it offers a ton of features for the price. We would highly recommend it for beginners to ensure that they do get the best possible value for their money when wading or angling for the first time. Next, we have the simple, yet still effective Patagonia Ultralight Wading Boot. The boot is constructed from a combination of lightweight synthetic leather and microfibers that offer great ventilation and support. Mesh has also been incorporated and while this will not really keep the water out, it will help to keep the sand from getting inside the boot. The large-lugged rubber soles designed for this boot were originally designed for rock surfaces. They have been adjusted and will hold up well in the water to ensure that you never fall on those slimy rocks. A reinforced toe box is included for the rocks you might walk into and this will offer some additional security and protection. We really love the inner sole and it is made from compressed EVA. This ensures comfort and the boots tend to mold to the shape of your feet as well. Should you be suffering from any foot problem like pronation or supination, these boots will certainly be the logical choice. They are also well-priced and with all of these features, we would definitely recommend them. 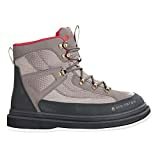 With a new and revolutionary approach to traction, the Patagonia Foot Tractor Wading Boot is designed for the experienced or professional angler. The boot has also been constructed from a synthetic upper and includes multiple drainage ports. Mesh has also been integrated to ensure the sand does not turn into a bothersome problem. The boot is quite flexible when compared to many of the others and this offers some additional versatility. The reinforced heel box is definitely something we love for more stability and security, but the outer sole is the new and revolutionary feature. With aluminum bars added, the boot will have some additional traction in the water. This will ensure that you cannot slip and offer much more stability on slippery rocks. The only downside is that they will eventually start to wear out and these can also be quite expensive to replace. The boot itself is already expensive and we would recommend this one to anglers who are using it often and in a professional way. With a felt sole, the Simms Rivertek 2 Boa Wading Felt Boot is one of the lighter boots you could buy. It features a synthetic upper that has been designed with care to be lightweight and to keep the water from getting in. However, if the water does make its way inside, the boot has excellent drainage ports to keep your feet dry and your boots free of water damage. TPU has been used for the inner shank and support and TPU skid plates have also been added to areas that could wear out quickly. Our only downside is the outer sole and while felt is great and offers excellent traction, it is still harmful to the environment and you will be limited to the states where you could use them in. The boot is not very expensive and will be a great boot to have if you are allowed to use the felt soles in your angling state. We were captivated by the lacing system and it has been designed to ensure that you can lace up the boots even with gloves on. These boots are not recommended for the traveling angler as you will not be able to use them everywhere. The Redington Skagit River boot is available with a felt or rubber outer sole. We commonly stick to recommending the rubber outer sole for the versatility and usability it offers. The boot is constructed from synthetic materials and does carry a little more weight than some of the others. However, we love the stylish and durable design. Mesh has been included in the design and this will not only keep the sand from getting inside but also allow the water to drain rapidly as you get out of the water. The collar has been padded as well and this offers some additional cushioning to keep you comfortable while the rubber toe cap adds another layer of security as well. This boot is actually really cheap and it might not be the number one boot on the market, but we would recommend it for the beginner. The boot is always nice to have if you quickly need to get in the water. It is also worth mentioning again that we do stick to recommending the rubber version of this boot. The Orvis Clearwater Wading Boot is an affordable, well-designed boot for anglers. It is constructed from synthetic materials and microfibers to ensure a lightweight and durable boot for a great angling experience. The boot is also available in both the felt and rubber versions, but we would once again like to recommend the rubber version for versatility. It features a rubber toe cap for additional security, while the inner sole is made from EVA. This molds perfectly to the shape of your feet and will also be ideal for those suffering from supination and pronation. The Vibram outer sole has been extensively tested on all aquatic surfaces and it also works well when trekking along the riverbanks. These boots are mid-priced and we would definitely recommend them for the value they offer. The intermediate angler will find them quite helpful and Orvis is also one of the most recognized and trusted brands when it comes to outdoor products. Free Standard Shipping on all Orders of $150 or more for all Orvis Products. Limited Time Only! Last but certainly not least, we have the Orvis Pivot Wading Boot and this boot is much similar to the previous boot. It has also been constructed from synthetic materials and microfibers, which makes it extremely lightweight and easy to dry. The boot features a Boa closure system that offers you maximum comfort and a secure fit, while the lug outer sole features a multi-directional pattern to ensure decent traction and safety on the slippery surfaces. It also includes a molded EVA midsole, which makes it perfect for those with foot problems and ensures the maximum amount of comfort. These boots are priced a little higher than average, but not yet in the high-end range. We would highly recommend them for the intermediate and expert angler and the versatility and comfort it offers is definitely something that will come in handy. The only downside is the fact that they do tend to be a little oversized. Now that you understand which boots are the very best, it can always be interesting to see which brands are the top brands and why they are as good as people think. We have searched up all the relevant information to give you a brief overview of some of these brands, so you could see exactly what sets them apart from the rest when making great wading boots. Simms is one of the top brands when it comes to wading boots. Their boots are known for all the trademarks they include and they have the patented RiverTread outer soles as one of their main selling features. These outer soles are made predominantly from rubber and they feature multi-directional lugs to provide quality traction on all the surfaces. The boots are extremely durable and synthetic leather has been mostly used for the uppers. We love the designs; however, the prices tend to be quite steep. If you are looking for unrivaled quality, you should consider looking into these boots. They offer a wide range of wading boots that include the felt and rubber soles. Versatility is synonymous with the Korkers brand and they offer a ton of different features to give you multifunctional use. The different outer soles can all be swapped out and if you feel the need to go with felt, you can use the same boot with a felt sole. The different outer soles can all be swapped out and if you feel the need to go with felt, you can use the same boot with a felt sole. 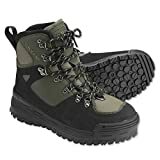 These boots are also quite affordable for all these features; however, they occasionally lack some durability and the soles do wear from time to time. Korkers is the perfect option for those living in states where the felt sole has not been banned and if you need to travel, you could simply swap it out for the rubber sole in areas where felt is banned. Patagonia wading boots are also quite durable with the synthetic uppers. They do give you some lean way when it comes to price and their main feature is the ventilation and drainage they offer. The mesh overlays will keep the sand from getting to your feet and it will allow the water to drain with ease once you get out of the water. Patagonia not only offers to boots but their outdoor clothing is made from the highest quality materials as well. Patagonia is perfect for the intermediate angler looking to transition to becoming a professional. Redington is one of the cheaper alternatives you could choose from and it offers decent durability for the price. These boots are more for beginners, but they can last you as an intermediate angler as well. We recommend Redington for their ingenuity and the lower prices they offer. They also have great ventilation and drainage. We do recommend sticking to the rubber outer soles. Orvis is a great brand and they have some of the best midsoles you could find in any wading boot. Most Orvis boots do include molded EVA midsoles and this is perfect for anyone suffering from problems like supination and pronation. The Orvis selections are mid-priced and they do have more expensive boots as well. Their newer rubber designs are perfect for the water and they offer some of the best traction you could possibly need. We highly recommend Orvis to intermediate and beginners before making the transition to a professional angler. All of these boots are definitely highly durable and made from quality materials. They do the same thing and they are perfect for waders. Choosing the best one is definitely not the easiest of tasks, but we have decided to stick to the number 1 brand on the market today. We have chosen the Simms G3 Guide Boot. It is available with the felt and rubber sole, but we do like the rubber sole for the traction and overall grip it offers. The boot is extremely light and offers great ventilation. It dries out quite fast and the specific synthetic leather will keep the boot from shrinking. This boot is perfect and can be used with most of the waders on the market today. If you are serious about angling and looking to get the best possible value for your money, we would highly recommend the Simms G3 Guide Boot. However, it is quite expensive, but we have seen that paying extra for quality is the best way to go in the end. We would like to thank you for reading this article and we certainly do hope that you have found the ideal wading boots. The best wading boots are definitely worth buying if you are a serious angler and we would like to recommend all of the above-mentioned boots. We would also like to encourage you to share your thoughts in the comment section below and let us know if you have used any of these boots and whether we might have missed any other of your favorite wading boots.